Alpro have yet another new addition to their range of soya yogurts. This one is their plain yogurt with added oats. As my favourite Onken yogurt is no longer being sold, I’ve been trying various different brands of non-dairy yogurt. 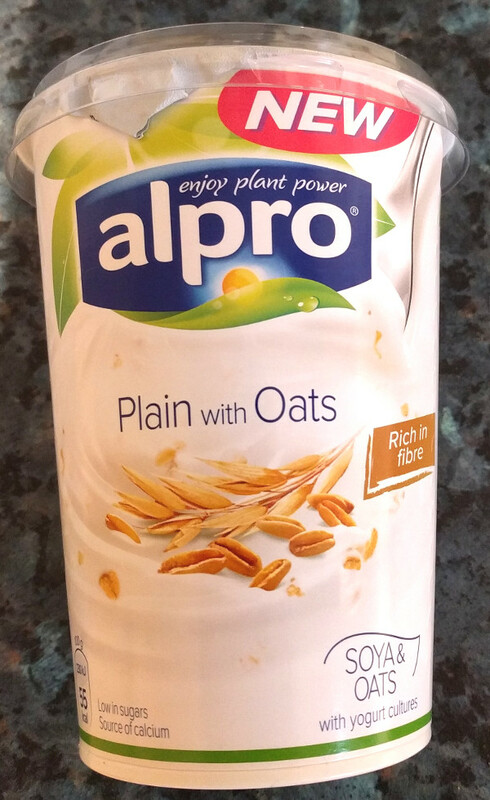 Alpro Plain with Oats is low in sugar, low fat, low saturated fat and low salt and has just 55 calories per 100g. “ Discover the goodness of soya and oats, Alpro Plain with Oats. Enjoy this plant-based alternative to yogurt packed it fibre, perfect for breakfast. The oaty texture and fine oatflakes give you a unique mild oat taste experience. Delicious with fruits or simply plain. SO many ways to enjoy every day. The taste of soy yogurt is quite different to dairy yogurt, and it’s taken me a while to get used to the taste. However, I quite like it now, especially as Alpro has quite a mild taste. I purchased this version with added oats because the sugars and calories are still low and I love oats. Peeling back the lid it’s clear to see lots of oaty bits mixed in the with yogurt. It smells just like the regular plain version and tastes the same. The difference obviously is this one has oaty bits. Considering that oats account for just 2.9% of the contents, I found that there were actually a lot of oats, and it was impossible to get a spoon without any oats. 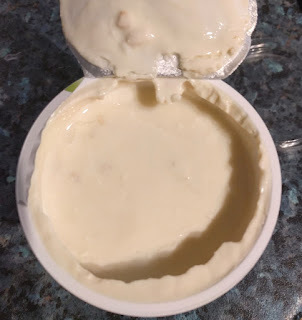 The texture of the yogurt is slightly chewy so it feels a bit more satisfying. I enjoyed eating it on its own without adding to anything. The label suggests it’s ‘rich in fibre’ but I wouldn’t go that far. 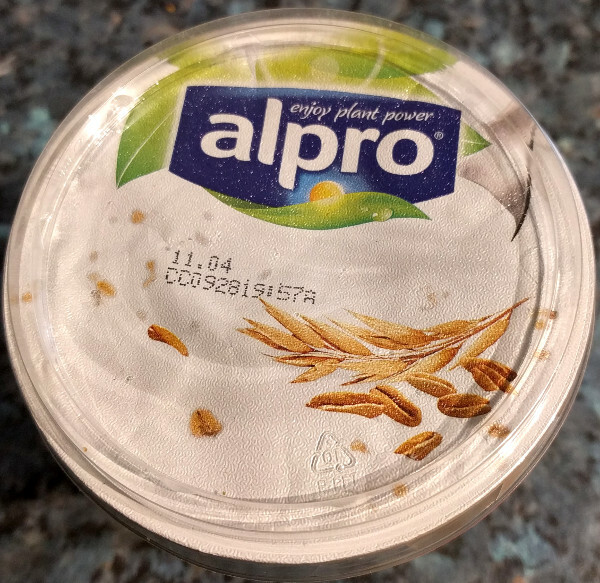 There’s 2.3g of fibre per 100g which isn’t a lot, but is just over twice the amount of fibre in the plain Alpro soya yogurt. This is definitely a soya yogurt I’ll be purchasing again. Availble in larger supermarkets including Waitrose and Sainsbury’s. Fermented soya product with oats, and added calcium and vitamins. Available in a 500g pot. 55 Calories, 2.0g fat, 0.4g saturated fat, 3.0g carbs, 1.9g sugars, 2.3g fibre, 3.8g protein, 0.09g salt. Vegetarian, vegan. (May contain traces of nuts - not peanuts). Ingredients: Water, Hulled Soya Beans (9.7%), Oat (2.9%), chicory root fibre, sugar, Calcium (Tri-Calciumcitrate), Acidity Regulators (Sodium Citrate, Citric Acid), Stabillliser (pectin), Natural Flavouring, Sea Salt, Antioxidants (Tocopherol-Rich Extract, Fatty Acid Esters of Ascorbic Acid), Vitamins (B12, D2), Yogurt Cultures (S. Thermophilus, L. Bulgaricus).